Rush have announced that they’ll release a new and expanded edition of their 1977 studio album A Farewell To Kings later this year. It’ll arrive on December 1 as a Super Deluxe Edition, on 3CD, 4LP and via digital platforms. The Super Deluxe Edition will include three CDs, a Blu-ray audio disc and four heavyweight 180g vinyl LPs. The set encompasses the Abbey Road Mastering Studios 2015 remastered edition of the album for the first time on CD – and a complete Rush concert recorded in February 1978 at London’s Hammersmith Odeon. It’s been newly mixed by longtime Rush engineer and original A Farewell To Kings producer Terry Brown from the multi-track live tapes. It will also feature four newly-recorded cover versions by Dream Theater, Big Wreck, The Trews and Alain Johannes, along with an instrumental studio outtake of the “spacey sound effects” used on the album titled Cygnus X-2 Eh. The Hammersmith show features more than 34 minutes of previously unreleased material, including the tracks Lakeside Park, Closer To the Heart and the complete 2112 suite. The Blu-ray disc boasts a new 5.1 surround sound mix by Steven Wilson, along with promo videos for A Farewell To Kings, Xanadu and Closer To The Heart. The new cover has been designed by Rush’s longtime creative director Hugh Syme – and he’s also created new pieces of artwork to accompany the album’s six original tracks. The liner notes have been written by Grammy-winning rock historian Rob Bowman. 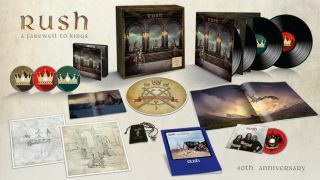 Also included in the Super Deluxe Edition is a King’s Ring with velvet pouch and neck chain, two lithographs, a 12-inch turntable mat and a reproduction of the 1978 A Farewell To Kings tour programme. All versions of A Farewell To Kings 40th anniversary edition are now available for pre-order. Find the full contents below. New Issue Of Prog Onsale Today!